Marcus Maddison in action for Posh v Scunthorpe. Photo: Joe Dent/theposh.com. Peterborough United manager Grant McCann has told star man Marcus Maddison to ignore the Twitter trolls and let his football do the talking. Maddison, the club’s joint-top scorer this season, received abuse from Posh ‘fans’ on social media following Tuesday’s (November 22) home defeat by Scunthorpe. Posh boss Grant McCann has played down Posh achievements so far this season. The 23 year-old reacted to the criticism and immediately regretted it. McCann addressed the problem with his player before training yesterday (November 24). “Posh fans need to realise how lucky they are to have a talent like Marcus at the club,” McCann stated. “Unfortunately social media can be a horrible place when you lose. “I have a folder full of letters I have received this season when we have lost. When we win I don’t get any. Posh celebrate a goal in their 5-1 win at Oldham last season. Photo: Joe Dent/theposh.com. “It’s the same on Twitter. When you win you won’t get any credit. It’s the way it is. People will always want to do you down. “The best way to deal with it is to ignore it and let your football do the talking. McCann takes his team back to the scene of his first match as Posh manager tomorrow (November 26). Following the sacking of Dave Robertson last September, McCann picked the team for a League One game at Oldham and watched his team win 5-1. Posh striker Lee Angol in action against Scunthorpe. Photo: Joe Dent/theposh.com. Tomorrow it’s about Posh getting back to winning ways and maintaining their top six status. The defeat to leaders Scunthorpe followed three straight League One wins, but McCann believes 22nd-placed Oldham are in a false position. “I’m not settling for sixth,” McCann added. “Being sixth doesn’t inspire me. I want more and I will always demand more. “It will be tough at Oldham though. They are where they are in the league, but they are better than that. “They have a good blend of youth and experience and they have some gifted footballers. “A repeat of last season would be nice, but I’m a realist. “This league is so tight and I expect that to be the case all season. Whoever performs on the day will win any given game and we have to make sure it’s our day tomorrow. McCann is without central defender Jack Baldwin because of suspension. 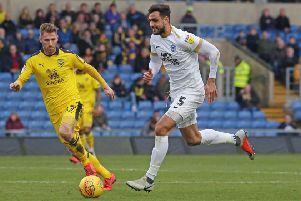 Michael Bostwick is expected to abandon his midfield role and partner Ryan Tafazolli at the heart of the Posh back four. Gwion Edwards would then come into midfield and there could well be a change up front with Lee Angol, who scored twice in this fixture last season, and Paul Taylor pushing Shaquile Coulthirst and Tom Nichols for their places.